Apex code is one of the strongly-typed programming languages that execute on Force.com platform. Apex is used to write DB triggers, to add business logic for the apps, and to add program controllers in the user interface layer. Apex has narrow integration with DB, and Query Language and web service support, which includes and governs the execution in multiple environments. Apex syntax is similar to Java and performs stored procedures. Apex allows the developer to include business logic with a record save process. Apex is on-demand, strongly-typed object-oriented programming language, where it is compiled and stored, and run on Force.com platform. Apex is pre-coded to perform unit testing and execute the test created. Note: Whatever we store in AKA APEX Class, it will be permanent. In the real world, you will often find many individual entities, all of the same kind. ( Eg: There may be thousands of mobiles, all of the same make and model.). In the programming world, the ‘class’ is just a blueprint of individual objects created. Class = Variables + Functions. Note: Class will not have any memory. //function to perform calling action. Apex functions are used to transform data from records, or in providing values to Visualforce attribs. They are used to evaluate Visualforce expression. We have different types of functions, in which 2 are popular. They are mentioned below. Apex Default functions: These are the functions which are predefined by salesforce. The syntax and the structure are to be used as below mentioned. “System.debug” - This is a default function for printing the output. Eg for User defined functions: These are the functions which can be customised according to the user requirement. Code:    //function to perform calling action. “ProductDelivery” - Custom function defined in the above sample code is a user defined function. Apex Object is also called as Variable of APEX class. In Computer Science, an object is a “Class in execution” or “Class in reality”. In the programming world, “object” refers to a real instance of a class where the object can be a combination of variables, functions + some memory. Eg: integer = age; - (Integer = class & age = object). Object = Variables + Functions + MEMORY. Memory is created for object name = “MyObjectProduct”. How to start working with the Object ? ProductDelivery = Custom function / User defined function. Scenario - Sample program for the class, function, & object declarations with output. Create a class ‘CalculatorAPEXClass’ which will give sum & multiplication of 2 numbers. We will get these 2 numbers from caller of the function. Sum function will return value to caller. Multiplication function won’t return, it will just print. The result variable you declare in class level, not inside function. Note: Public/Private are called as access specifiers in the program. Variable - Variable is a private value. Function - Functions is a public value. So, we declare variables by private and we declare class / function by public. Login to salesforce org → Click on the Login name → Click on “Developer Console” → File → New → Apex Class → Write the name of the class you want to save on(eg: CalculatorAPEXClass ) → Ok.
Then, the apex class is created as shown below. Now, copy the code on the screen available and Save(Ctrl + S). Note: Class will have no memory which is the biggest drawback. Without memory, the code is useless as we need to create an Object for it. Note: To design any code,we need APEX Class. To execute any code, we need Object. In Salesforce, most of the time, the function inside the class can be used without using Object or without creating any Object!! As class does not have memory, it’s of no use. But if we provide memory, it’s useful. For this, we specifically declare the function / variable as ‘Static’. When we declare any function as static, we need not generate object of the class for executing the function. We can execute/call function using the class name directly. The reason behind this is, as soon as we declare any function / variable as static, we get “special memory” for that entity to perform the work and this way, we can skip creating object, and complete the work successfully. Why It’s called Special Memory? This special memory helps the data to persist / be available across different pages / classes, unlike normal variable. So, we can refer the value anywhere. In short, in Salesforce Real-Time Projects, we will create static variables and function most of the time. Scenario - In this scenario, we have to make a video call using mobile to a particular person. Program #1 - Make changes in such a way that we can bypass Object and still call functions. 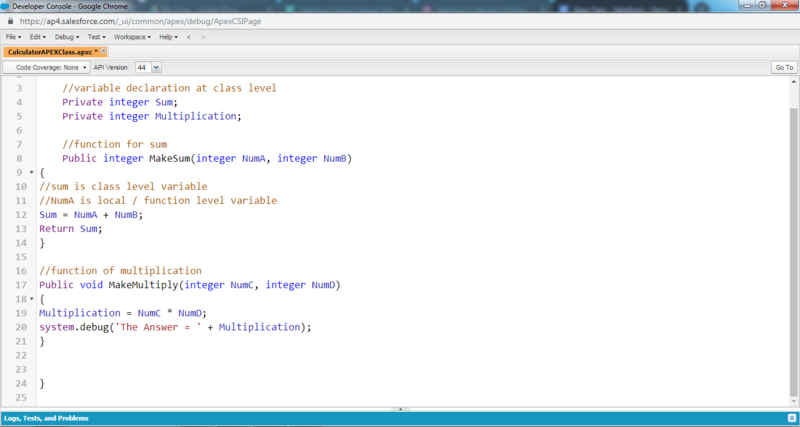 Program#2 - Sum, Multiply below code without object declaration (using static in class function). In the next topic, we will discuss in-detail about “How to call APEX or Run any code”. Keep following us for more info on Salesforce Development / Programming.